Why was USA disqualified from the 4x100 men's relay final in the Rio Olympics? After the mens 4x100 relay final races in Rio on August the 19th the commentators said they exchanged the baton outside the box. 4x100m relay are composed by 4 runners that run approximately 100m each. To avoid that a faster athlete run a longer section are imposed limits for the passage of the baton. To add to Ale's thorough answer: in the case of any disqualification in a major athletics event, the official results will usually cite a specific rule in the IAAF competition rules (which Ale linked). If you look up that rule you see what violation they're being disqualified for. In this case it wasn't immediately obvious which exchange was the problem from the results, but often the rule cited in the results gives you the clue you need to explain the disqualification. They have a set margin of distance called the exchange zone to hand off the baton. The USA team handed the baton off before the exchange zone started therefore being disqualified. Not the answer you're looking for? Browse other questions tagged rules terminology olympics running track-and-field or ask your own question. 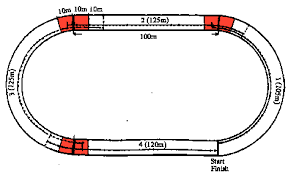 What happens if there is a tie during an olympic race? What does it mean to 'turn pro' in a sport? Bolt + Blake + Powell ever run together in a 4x100m relay? What are “holding numbers” in cycle races? What is the point of the “Small Final” in Snowboard Cross? How does the Western States 100 choose the qualifying time for 100Ks?